We've talked in the past about the various things which can attract us to a movie. The stars, the trailer, or perhaps the story. Or perhaps we are seeking a personal connection to the movie. We often watch movies for escapism, but there are times when you want a movie to mean a little bit more. I didn't approach Genius with in mind. However, a movie about a writer from my home state certainly clicked on some level. But, did it portray either of those things in a positive light? 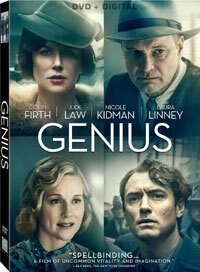 Genius begins in 1929 and tells the story of Max Perkins (Colin Firth), a book editor in New York City. Perkins has created quite a reputation, having worked with Ernest Hemingway and F. Scott Fitzgerald. A new writer arrives at his doorstep armed with a large manuscript. Thomas Wolfe (Jude Law) has been rejected by many other editors and he sees Perkins as his last shot. Although Perkins knows that the book will take some work, he embraces Wolfe. The two quickly become close, working together everyday -- Perkins even takes Wolfe home to meet his family. Despite the promise of his work, Wolfe is an eccentric individual, prone to very strong feelings and bouts of histrionics. Once Look Homeward Angel is a success, Wolfe and Perkins begin work on the next book. But, this one starts out as 5000 assorted pages. Can they turn it into a workable manuscript? Longtime visitors to DVDSleuth.com may know that I relish a "I've heard of these people, why haven't I heard of this movie?" review and it's been a long time since I've done one. However, Genius is a good one. Along with Firth and Law, we have Nicole Kidman, Laura Linney, Guy Pearce and Dominic West. This all-star cast is joined by noted screenwriter John Logan (the recent Bond movies), who adapted a book by A. Scott Berg. The film focuses on a literary icon who is still studied to this day. So, why has this movie flown under the radar? There could be some reasons. Despite the fact that Wolfe is well-known and people quote the title of his last book, You Can't Go Home Again as if they know what they are talking about, movies about long-winded authors who died young may not be the most popular genre ever. Even when biopics are about people whose name you might recognize, you still want it to be something exciting. Or it could be because the main character isn't actually Wolfe, but Max Perkins and no one has ever heard of Max Perkins. Having now seen the movie, I now know that there are two other reasons. The first is that, as portrayed in the film, Wolfe doesn't come across as a very pleasant person. At first, his enthusiasm for his work and the prospect of being published is infectious. But, then the real Wolfe is revealed as we see that it's narcissistic and over-bearing. It’s understandable that he doesn’t want his work altered, but his obsession gets to the point that it begins to drive everyone away. The other thing has to do with Law’s performance. To say that he chews the scenery would be an understatement. With his syrupy thick Southern accent and his gesticulations, Law’s acting borders on cartoonish. It’s saying a lot that his best performance as an author is still Lemony Snicket. On the positive side, Genius does its job as a biopic as I did learn a great deal about Wolfe and Perkins (of whom I’d never heard). We get a great, stoic performance from Firth and a scary one from Kidman. Does the portrayal of Wolfe and Law’s performance ruin the movie? Not necessarily. If the goal was to show us how off-putting Wolfe could be, it succeeded. But, that also makes the movie difficult to watch. If you go into Genius knowing that you aren’t going to life Wolfe, that may make the movie easier to enjoy. But, keep in mind, Wolfe should not be seen as a standard-bearer of Daily Tar Heel alums. Genius should have told us more about the hat on DVD courtesy of Lionsgate. The film has been letterboxed at 2.35:1 and the transfer has been enhanced for 16 x 9 TVs. The image is sharp and clear, showing no overt grain and no defects from the source materials. This is a very monotone film, but the few flashes of color which we get look fine, and the movie is never overly dark. The picture never gets distractingly soft and the depth is fine for a DVD. The DVD carries a Dolby Digital 5.1 audio track which provides clear dialogue and sound effects. This is a fairly quiet film, but we get some notable stereo and surround effects from the street scenes and the train station scenes. Also, the score fills the speakers. The Genius DVD contains only two extra features. "Genesis of Genius" (14 minutes) offers interviews with those involved with the film, including Author Scott Berg, on whose autobiography of Perkins the film is based. We also hear from Firth, Director Michael Grandage, and Screenwriter John Logan. They discuss how the project came together, and then we get into the meat of the production where we hear from other cast members. "Painting a Portrait of the Lost Generation" (15 minutes) looks at the relationship between Perkins and Wolfe, including how they were portrayed in the film, as well on touching on the literature of the era.